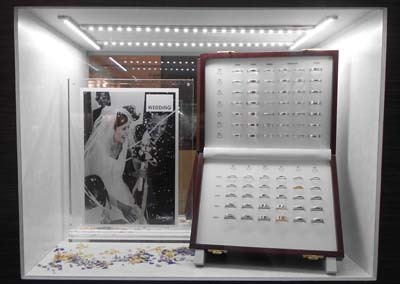 Domino’s ‘Wedding Ring Box’ – a collection of 72 popular styles including plain, shaped and diamond-set designs as well as a choice of finishes which can be applied – from which the groom chose his rings. When Piggotts the Jewellers of St. Ives in Cambridgeshire got the call to say that a film crew would be visiting their store on April Fools’ Day to make a TV programme they naturally suspected a set up. 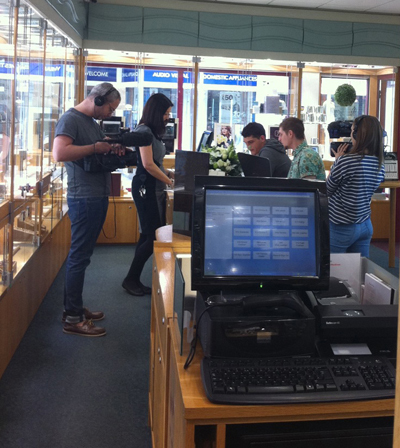 However, good to their word, the production company responsible for making the BBC 3 series ‘Don’t Tell the Bride’ arrived as scheduled at 11.00am with a soon-to-be groom intent upon purchasing the couples’ wedding rings in their store using some of £12,000 provided to him by the programme makers and from which – without consulting his bride – he has to stage their wedding day. Domino has long supplied Piggotts with bridal jewellery and the job of selling these particular rings fell to Emma Haycock, an experienced sales assistant who has been working for the store for over four years and who has recently passed her JET 2 examinations through the National Association of Goldsmiths, of which the shop is a member. “Emma was very professional and confident and didn’t seem at all phased by the microphones and the cameras – although clearly it wasn’t very easy to act naturally with all the other staff and customers watching her. It took her around just over an hour to close the sale, which is what we would normally expect for a bridal purchase,” says store manager, Sarah Edwards. The film crew of ‘Don’t Tell the Bride’ at work at Piggotts on 1st April. The groom, who must remain nameless, was immediately attracted by an unusual beaded 9ct white gold band for his wife and eventually chose this and a plain D-shaped white gold band for himself both from the Domino Wedding Box. “He said if the rules of the show allowed he would have liked to have spent the entire budget on the rings, but unfortunately that wasn’t allowed,” says Sarah Edwards. The wedding will take place in just over a week so speed of delivery was an important consideration for Piggotts. “We did try to steer him towards Domino because we know they can provide a quick turnaround. Unfortunately the rings he actually chose are not stock items but nevertheless they will be able to make them and get them to us well in time for the big day,” says Sarah Edwards. What the bride will make of her husband’s choices with regard to their big day in general will not be known until the programme is aired in September 2014 but both Domino and Piggotts are confident that, if nothing else, she’s going to love her ring.